Is this SERIOUSLY how Spring Break is going to start? We don’t like to complain, but cooooooooo (OM) ooooome on! This snow needs to go. We are so ready to feel the sun on our faces – and to peel off a few of these layers. Okay, enough of all that. We know that we need to let it go, and luckily there are lots of events available this week to help us do just that. Check them out and let us know where you will be getting your flow on! Hashtag #njyogacollective and #practicelocalnj and maybe we can meet up for a few asanas! Experience the relaxing power of Restorative Yoga, enhanced by the dynamic healing of Reiki treatments. Complete your practice with Yoga Nidra on a journey to ultimate bliss. This restorative yoga sequence involves only five or six poses, supported by props that allow you to completely relax and rest. Held for 5 minutes or more, restorative poses include light twists, seated forward folds, and gentle backbends. Most restorative practices are based on the teachings of B.K.S. Iyengar. Join Leah Guy, spiritual teacher and author of The Fearless Path; A Radical Awakening to Emotional Healing and Inner Peace, for her Fearless Living workshop. She will help you to focus on how to shift your fear energy (anxiety, phobias, ocd, repetitive thinking). We will focus on the Root and Crown Chakra and their intricate meanings to get to the real issue that’s causing your distress. You will begin to recreate your foundation to change your life, meaning zero panic, no fear and more peace.In addition to powerful meditations, we will work with practical exercises, or “Emotional Workouts,” that will help you shift the fear energy of your mental and emotional habit pattern. We are moving to a bigger and better location..right down the street! From 351 to 335, we will have more space, a front entrance, a place for yoga outdoors AND if you haven’t been to the studio in a while we do hope that you will join us for our Grand Opening celebration on April 7th, where we will be offering FREE classes with four of the five of our FAB teachers! 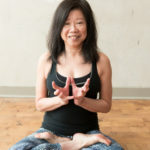 This 2-hour – workshop will combine self-massage techniques and breath work to help you reduce pain, prevent injuries and improve whatever form of movement you most enjoy. You will learn about your anatomy and how to use Therapy Balls to help release muscle tension and tight fascia; increasing overall body awareness and decreasing body blind spots. This workshop is a perfect accompaniment to any form of fitness training – yoga, running, weight-lifting, etc. If you want to get to know your body a little better, and eliminate some of the many “body blind spots” that we all have, these workshops are for you. No yoga experience is necessary. The wall has been with you since you first stepped onto your mat. Now discover how it will help you dive more deeply into your asana practice. In this master class we will use the wall as an aid for proper alignment, as a vehicle for deepening postures, as a tool for exploring fun sequences, as an assistant for inversions, and as a support for restorative postures. The pelvic floor is an often neglected part of our anatomy.When well toned and activated, this wrap of muscle between the pubic bone and the tail bone supports a surprising range of health benefits: improved bladder functioning, regular bowel movements, prevention and alleviation of hemorrhoids, a balanced reproductive system, and a soothing of the sympathetic nervous system. But when the muscles of the pelvic floor grow weak, the forces of time and gravity take their toll, and we gradually fall prey to a host of problems.Yoga can help you strengthen weak pelvic floor muscles and relax tight ones. A practice which coordinates alignment with slow, considered movements and the breath, is particularly well suited. Learn which poses are right for you and ancient Ayurveda strategies to help support and deepen you relationship with your own pelvis and pelvic floor muscles. The Asbury Hotel is proud to host Yoga with Cats in The Asbury Hall. Come bend and stretch with adoptable cats from the MCSPCA & Jersey Shore Animal Foundation and Catsbury Parks own Yoga instructors Stef, Michele & Jon. Classes will be designed to include everyone with no level of experience needed. Think of it more as a relaxing way to start your day, surrounded by cats, doesn’t get any better really, does it? Bendy Jane Yoga focuses on bringing Yoga to unique and unconventional venues. Sticking with their beginner focus, they offer different types of yoga in each class, allowing newcomers to get a taste of different styles. Each class begins with Bridget teaching a sensory meditation followed by gentle stretches. Halfway through, Justine guides students through a strengthening flow then closing out with a blissful Indra savasana. Flying Fish will provide a beer post practice. Please help us raise money to save the lives of homeless cats & dogs! Join us for a gentle yoga class surrounded by adorable kittens. Let’s find out how much love can we fit in one room. Maybe you will even fall in love with one of our feline participants and adopt! 100% proceeds donated to Pure Heart Rescue. As the Spring season begins, take some time to rejuvenate your spirit, soul and senses with this two-hour restorative workshop with Laura. During the workshop we will find our sense of solitude with various restorative poses, reike and through the use of essential oils. All levels welcome. We See You On Instagram, NJ Yogis!